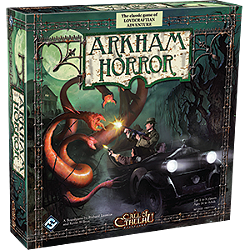 Follow the steps below to prepare for a game of Arkham Horror. Unfold the board and place it in the center of the playing area. Make sure there is ample space around the edges of the board to place the investigator sheets and card decks. Place the various tokens and the dice near the board. Make sure to place the terror track marker on the "0" space on the terror track. Place one Clue token on each location on the board that has a red diamond above it. These locations are unstable and represent the places where dimensional gates can open and monsters can appear. Locations are identified by circular illustrations overlaying the Arkham portion of the game board (for example, Silver Twilight Lodge and Ma's Boarding House). Select one player at random to be the first player. Give the first player marker to that player. The first player shuffles the 16 investigator sheets. Then, without looking, he randomly deals out one investigator sheet in front of each player, including himself. Alternately, the players may agree to choose their investigators, starting with the first player and continuing clockwise until every player has selected an investigator. The first player shuffles the eight Ancient One sheets. Then, without looking, he selects one at random and places it face up near the board. This is the Ancient One that is threatening Arkham for this game. If the Ancient One's ability lists any actions that take place at the start of the game, such as Nyarlathotep's "Thousand Masks" ability, they are resolved now. Alternatively, the players may choose which Ancient One they face. This is often helpful if there are time constraints or other considerations involved. (Yig makes for a shorter game, for instance, while Cthulhu makes for a particularly challenging game). Separate the various investigator and Ancient One cards into their respective decks and place them near the board as shown in the setup diagram. On each investigator sheet, certain items may be listed as fixed possessions. Each player, beginning with the first player and continuing clockwise, now receives the items listed on his investigator sheet in the "Fixed Possessions" area. The first player should locate the appropriate cards in the investigator decks and pass them out to the players, as noted on their investigator sheets. The players shuffle the Common Item, Unique Item, Spell, and Skill decks, then return them face down to their places next to the board. Whenever players draw cards, they draw them randomly from the tops of these decks. Each investigator sheet may indicate that the investigator receives one or more random possessions. Each player, beginning with the first player and continuing clockwise, draws the indicated number of cards from the appropriate decks, as listed on his investigator sheet in the "Random Possessions" area. Note: Abilities that affect drawing cards from the card decks, such as Monterey Jack's Archaeology ability, do work when drawing random possessions at the start of the game. Each player now receives a number of Sanity tokens equal to his investigator's Sanity value and a number of Stamina tokens equal to his investigator's Stamina value. These values are listed on each investigator sheet. Each player should place these tokens near the appropriate area on his sheet. Each player also receives three skill sliders and places one skill slider on each of his three skill tracks. Each skill slider may be placed on any one of the four "stops" of each skill track. Place the monster markers in an opaque container and randomize them. A coffee cup, plastic container, or cloth bag works well for this purpose. Throughout these rules, we'll refer to this container as the monster cup. 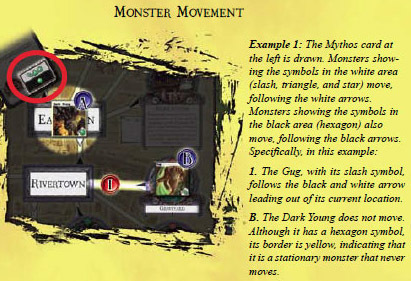 When a monster appears or otherwise enters play, the first player draws a monster marker randomly from the monster cup and places it on the game board as instructed in these rules or in the text of a specific card. Exception: Do not place the five "Mask" monsters in the container unless Nyarlathotep is the Ancient One. If any other Ancient One has been revealed, remove the Mask monsters from the game (simply return the markers to the box). Mask monsters are identified by the word "Mask" printed on the combat side of their markers. The players now shuffle the Gate and Mythos decks, and then return them to their places next to the board. Next, they shuffle the 16 Gate markers and place them face down in a stack next to the board. 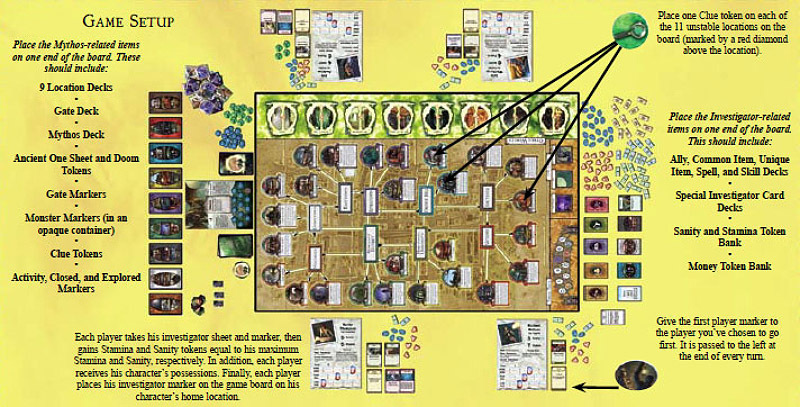 Each player now takes the investigator marker depicting his investigator and places the marker on the game board location indicated on his investigator sheet in the "Home" area. The other investigator sheets and markers, as well as the unused Ancient One sheets, may now be removed from the game. Finally, the first player draws the top card of the Mythos deck and resolves it as described in the Mythos Phase section of the rules. If a Rumor is drawn, discard it and draw again until you draw a Mythos card that isn't a Rumor. The Mythos card will indicate an unstable location where a gate and monster appear. Remember, unstable locations are identified by red diamonds on the game board. Important: Remember to place a doom token on the Ancient One's doom track after the first gate opens. 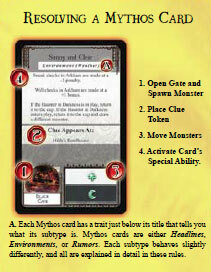 After the Mythos card has been completely resolved, the first turn begins, starting with the first player. 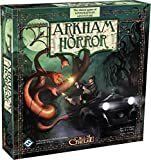 In Arkham Horror, a terrible creature from beyond time and space is waking, roused by the dimensional gates that are opening all over the city. The players must join forces to close all of the gates before this Ancient One awakens. If the Ancient One defeats the players, all of Arkham is doomed. The players must work together as a team of investigators to close all of the dimensional gates, seal them permanently, or if that fails, defeat the Ancient One when it awakens from its slumber. During the Upkeep Phase, each player takes the following actions, in order. Some cards exhaust themselves when used, which means that they are turned face down for the remainder of the turn. At the start of the Upkeep Phase, each player refreshes those cards by turning them face up. Simply remember that you can use face-up cards and that you cannot use face-down cards until you turn them face up again during the next Upkeep Phase. Example: Richard (playing Harvey Walters) cast his Wither spell last turn, forcing him to exhaust the card by turning it face down. During the Upkeep Phase, Richard turns the Wither spell face up once more. The spell is now ready for him to cast again. After refreshing his exhausted cards, each player must review his investigator's cards to see if any of them have an Upkeep action. Each player must perform all Upkeep actions listed on his investigator's cards every turn. Upkeep actions may be taken in any order the player wishes. Bless, Curse, Bank Loan, and Retainer cards do not require an upkeep roll during the first Upkeep Phase after an investigator acquires them. Example: Looking over his cards, Richard finds that he has a Retainer card, which requires an Upkeep action. First, Richard receives $2 for the Retainer. He takes two money tokens from the pile of money tokens in the play area. Richard must then roll a die to see if he keeps or loses the Retainer. Richard is fortunate and keeps the Retainer card for another turn. Finally, each player may adjust his investigator's skills using the three skill sliders he placed on his investigator sheet during game setup. This process, as well as a general description of how skill sliders work, is explained in the "Adjusting Skills" diagram. Exception: During game setup, players may set their three skill sliders on any of the four stops on their three skill tracks. This initial setup does not adhere to the normal rules that restrict the number of stops a slider may be moved each turn. 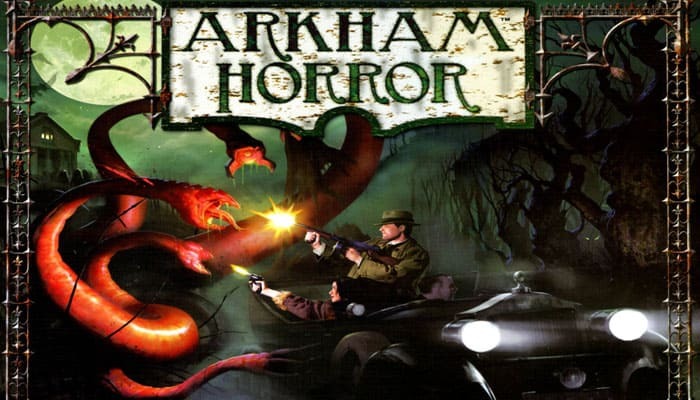 During the Movement Phase, each player takes one of the following two movement actions, depending on whether his investigator is in Arkham or an Other World: Arkham movement or Other Worlds movement. The two types of investigator movement are described below. 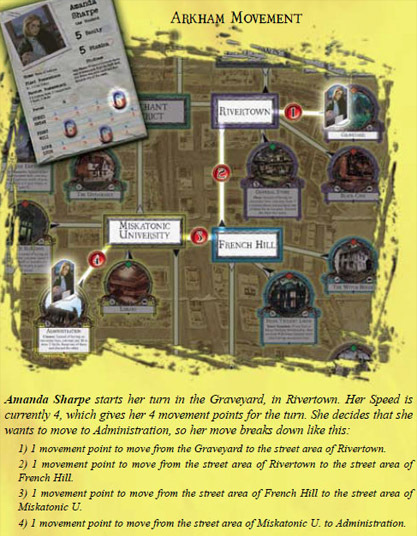 If the player's investigator is located in Arkham (i.e., his investigator marker is in the town area of the game board), he receives movement points equal to his Speed value, as found on his investigator sheet. A player may spend one movement point to move his investigator marker from one board area to another, so long as the two areas are connected by a yellow line on the game board. One movement point allows an investigator to move from a location to a street area, from one street area to another, or from a street area to a location. Locations are indicated by circular illustrations on the Arkham portion of the game board. 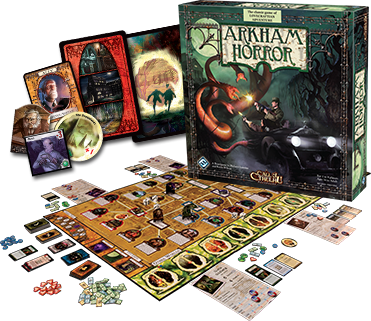 Street areas are represented by rectangular boxes on the game board, one for each neighborhood in Arkham (for example, Miskatonic U. and Rivertown). Locations and street areas that contain monster markers may affect an investigator's movement. Each time an investigator attempts to leave a location or street area occupied by one or more monster markers, the investigator must either fight or evade each of the monsters there. Likewise, if an investigator ends his movement in a location or street area occupied by one or more monsters, he must fight or evade each such monster. If the investigator fails to evade a monster, the monster immediately deals its combat damage to him and he immediately enters combat with it. Once an investigator begins combat with a monster for any reason, his movement is over. Regardless of whether or not he wins the battle, the investigator loses the rest of his movement points and must remain where he is. Any time an investigator ends his movement in a location that contains Clue tokens, he may immediately take any or all of those Clue tokens. The investigator may not take any Clue tokens if he merely moves through the location and then continues his movement: He must end his movement in the location containing the Clue tokens. Other Worlds are represented by the large circular spaces along the edge of the game board. These spaces represent bizarre locales, strange dimensions, and alternate worlds that figure prominently in the Mythos. Players typically enter these worlds by exploring gates. Note that each circular space representing an Other World is bisected by a prominent line: The areas to the left and right of this line are the two areas of the Other World. If an investigator is in an Other World at the beginning of the Movement Phase, he receives no movement points. Instead, his movement depends on whether he is in the first (left) or second (right) area of the Other World. If the investigator is in the first area of the Other World, he moves to the second area. If the investigator is in the second area of the Other World, he returns to Arkham. The player must choose a location that contains a gate to the Other World he is leaving. After choosing such a location, he places his investigator marker there. Then he places an "explored" marker underneath his investigator to show that he has explored the gate. This marker remains in play as long as the investigator remains at the location. If there is no open gate leading to the Other World the investigator is in, the investigator is lost in time and space. During the game, certain effects can cause an investigator to become delayed. When this occurs, place the investigator marker on its side, indicating the delay. Delayed investigators receive no movement points and do not move during the Movement Phase. Instead, during the investigator's Movement Phase, the player stands the investigator marker back up to show that the investigator is no longer delayed. On the following turn, the investigator will be able to move once again as normal. During the Arkham Encounters Phase, each player whose investigator is in a location (not a street area or Other World area) must take one of the following actions. The action the investigator must take depends on whether his location contains an open gate or not. If the location has no gate, the investigator has an encounter at the location. The player shuffles the location deck corresponding to the neighborhood his investigator is in and draws a card from the deck. 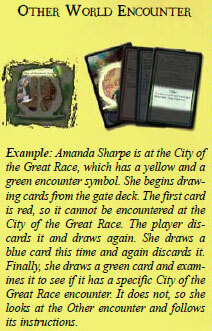 The player then finds the entry for his investigator's location, reads the entry aloud, and performs any actions indicated by the card text. Note that the card may indicate that "a monster appears", in which case the investigator must either evade the monster or fight it. 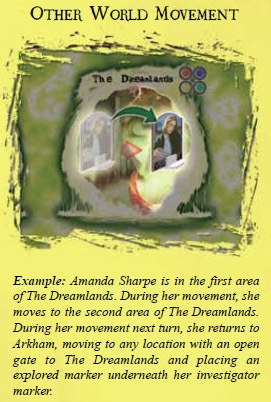 Once the player has resolved any actions indicated by the card, he returns the card to the location deck. Monsters and gates cannot appear in sealed locations, even if this is directed by the text of a card. Monsters that appear as the result of a location or gate encounter never remain on the board after the encounter is resolved. If an investigator evades such a monster, return it to the monster cup. If the location has a gate, the investigator is drawn through the gate. He moves to the first area (the left area) of the Other World indicated on the gate marker. Exception: Once an investigator has entered a gate and returned to Arkham, the player places an explored marker underneath his investigator marker. While he remains in the gate's location, he is no longer drawn through the gate, but may instead try to close or seal the gate. If the investigator leaves the location before the gate is closed or sealed, discard the explored marker. If the investigator returns to the location later in the game, he will again be drawn through the gate. He must resolve the Other World Encounters Phase again before he can return to the location and attempt to close or seal the gate. Important: If an investigator is drawn through a gate that appears as a result of an encounter (such as "A gate appears!" or "A gate and a monster appear! "), then he is delayed, just as if he had been drawn through a gate in the Mythos Phase. 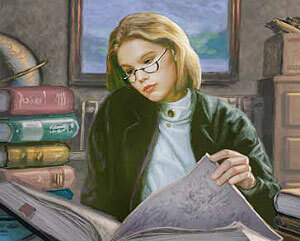 During the Other World Encounters Phase, investigators in Other World spaces have encounters there. The Other World spaces on the board are marked with circular icons of different colors. These colored circles are called encounter symbols. When an investigator has an Other World encounter, the player draws cards from the gate deck, one at a time, until he draws a card whose color matches one of these encounter symbols. Gate cards that do not match a color of the encounter symbols are placed face down on the bottom of the gate deck. Once the player has drawn a gate card that matches an encounter symbol's color, he examines it to see if there is a specific encounter for the Other World his investigator is currently in. If a specific encounter is listed, the player reads that entry aloud and performs any actions indicated by the card text. If there is no specific encounter listed, the player reads the "Other" entry aloud and performs any actions indicated by the card text. The card text of an Other World encounter may result in a monster appearing, in which case the investigator must either evade the monster or fight it. Once the encounter is resolved, the player then discards the card face down to the bottom of the gate deck. Monsters that appear as the result of location or gate encounters never remain on the board after the encounter is resolved. If an investigator evades such a monster, return it to the monster cup. Each of these actions is performed as follows. 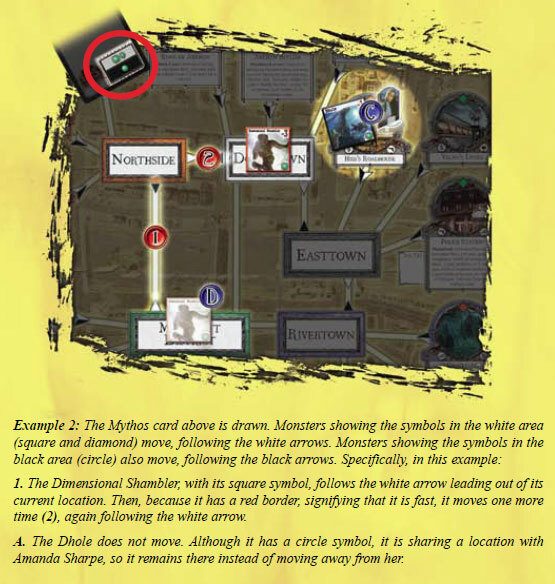 The first player begins by looking at the lower-left corner of the Mythos card he has drawn to see where the dimensional forces are assaulting Arkham this turn. One of three things happens, depending on whether there is an open gate, an elder sign marker, or neither at that location. 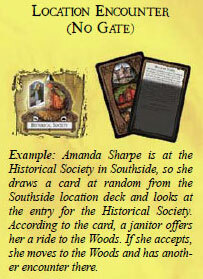 If an elder sign token has been placed at the location, nothing happens. No gate opens and no monster appears. The elder sign has permanently sealed the gate at this location, and no new gates can open here. If there is already an open gate at the location, a monster emerges from every open gate currently on the board. This is called a monster surge. When a monster surge occurs, the number of monsters drawn and placed is equal to the number of open gates or the number of players, whichever is greater. The first player draws monster markers from the cup at random and places them on each location with an open gate. When placing monsters, they should be divided as evenly as possible among the open gates, with no gate having more monsters placed on it than the gate where the monster surge occurred this turn. If there are more monsters to be placed than allowed by the monster limit, the players should decide where monsters will be placed. The players must make this decision before monsters have been drawn from the cup. If the players cannot agree where the monsters are to be placed, the first player decides the placement. Example: There are 3 open gates (at the Black Cave, Science Building, and Unvisited Isle), 7 players, and no monsters in play when a Mythos card is drawn that opens a gate at the Black Cave. This causes a monster surge: 7 monsters are drawn from the cup and placed on the open gates. They must be distributed as evenly as possible, so each of the 3 gates gets 2 monsters placed on it, and the 7th monster is placed on the Black Cave, where the monster surge occurred. The Black Cave now has 3 monsters, while the other 2 open gates each have 2 monsters on them. The first player places a doom token with the eye symbol face up in the first available space on the Ancient One's doom track. If the marker is placed in the last available space on the doom track, the Ancient One has awakened and the end of the game has begun. If the Ancient One awakens, you do not need to complete the rest of the Mythos Phase: Proceed immediately to the final battle. Note that it is also possible for the Ancient One to awaken because there are too many gates open in Arkham at once. The first player draws a gate marker from the stack of gate markers near the board and places it face up on the location. Discard any Clue tokens that were on the location: The investigators have missed their opportunity to follow up on those leads. The first player draws a monster marker from the cup at random and places it on the location. If this would bring player places the monster in the Outskirts instead. Exception: If there are five or more investigators playing, then draw and place two monsters instead of one. Important: Unlike investigators, monsters are never drawn through gates. If a gate opens at a location that contains an investigator, he is immediately drawn through the gate to the first area of the corresponding Other World. As a result of the sudden disorientation caused by the gate swallowing him, the investigator is delayed. Place his investigator marker on its side. The investigator will not move during the next Movement Phase. Most Mythos cards indicate a location where a Clue token appears. Place a Clue token on the indicated location unless there is an open gate there. If one or more investigators are at that location, one of them (they should decide among themselves) may immediately take that Clue token. If the players cannot agree on who gets the Clue token, the first player decides. Although monsters start out in locations as they emerge from gates, they soon leave those locations to roam the streets of Arkham. In order to determine monster movement, the first player looks at the lower-right corner of the Mythos card he has drawn for the turn. This area describes which monsters move during the turn as well as the direction they move on the board. Each Mythos card has two movement areas on it, represented by black and white boxes. Each location and street area on the board likewise features a black or white arrow. Each movement box on a Mythos card also has one or more dimension symbols printed in it. Each monster marker likewise features such a dimension symbol on its movement side. If the monster is listed in the white movement box, it follows the white arrow leading out of its current area. If the monster is listed in the black movement box, it follows the black arrow leading out of its current area. Important: The arrows leading out of some locations are black on one side and white on the other. These arrows count as both a black arrow and a white arrow, so monsters listed in either the black or the white movement box of the Mythos card follow that arrow. A monster that already shares a location or street area with one or more investigators does not move and remains in place. Certain monsters move several times (see the description of "Fast" monsters below); when such a monster enters an area that contains one or more investigators, it must immediately stop moving. No encounter with the monster takes place during this phase, but the investigators will be forced to evade or fight the monster during the Movement Phase. Example: A Star Spawn moves into Uptown, where Joe Diamond and Ashcan Pete are currently located. During their next Movement Phase, one or possibly both of these investigators will need to deal with the Star Spawn. Most monsters move as described above, but some monsters have special movement abilities that follow special rules. There are five different types of monster movement in Arkham Horror. Normal (Black Border): Normal monsters move as described above. Stationary (Yellow Border): Stationary monsters never move. They always remain at the location where they entered play. Fast (Red Border): Fast monsters move twice, following the appropriate arrows for both steps of their movement. Fast monsters stop moving immediately if they encounter an investigator. Unique (Green Border): Monsters with unique movement (such as the Hound of Tindalos) have special movement abilities listed on the combat side of their monster markers. Turn such a monster marker over and follow the instructions there. 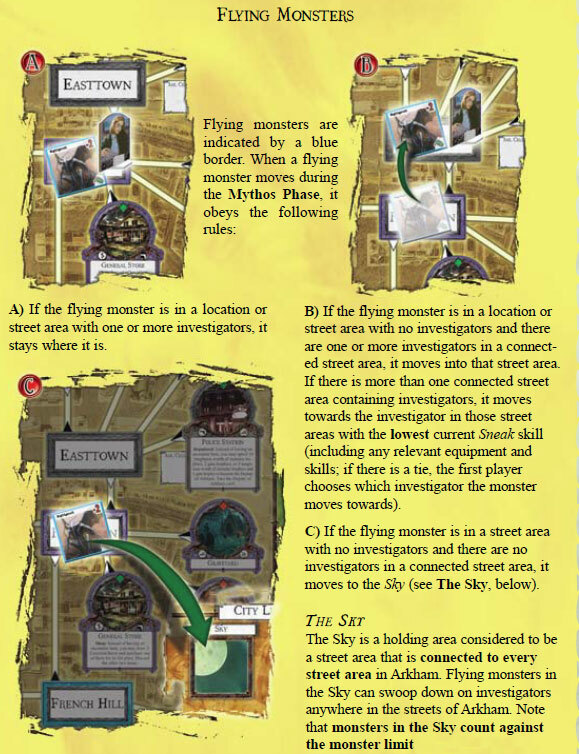 Flying (Blue Border): Flying monsters generally move directly towards the nearest investigator in a street area, or move to the "Sky" holding area if they can't reach any investigators this turn. Finally, the first player looks at the special text on the Mythos card, examining the trait listed at the top of the card. The various traits indicate different types of Mythos cards. Headline: The first player immediately resolves the special text of a Headline Mythos card. He then discards the Mythos card face down to the bottom of the Mythos deck. Environment: The special text of an Environment Mythos card remains in play for several turns, possibly even until the end of the game. The first player places the card face up next to the game board, discarding any previous Environment Mythos card face down to the bottom of the Mythos deck. This means that only one Environment Mythos card can be in play at a time. Rumor: The special text of a Rumor Mythos card remains in effect until either the Pass or Fail condition on the card is met, at which point the card is resolved and is discarded face down to the bottom of the Mythos deck. Only one Rumor can be in play at once. If there is already a Rumor Mythos card in play, ignore the special text of the newly drawn Rumor and discard it face down to the bottom of the Mythos deck after resolving its other effects for the turn (such as gate opening and monster movement). Other Effects: Additionally, the Mythos card may call for one or more "activity" or "closed" markers to be placed on specific locations. Simply place the respective markers on the locations indicated by the card. If the card leaves play, remove the markers from the locations as well. Once the first player has resolved all steps of the Mythos Phase, the first player marker is passed to the left. The turn is now over and a new one begins with the Upkeep Phase. Play continues in this way until the end of the game. 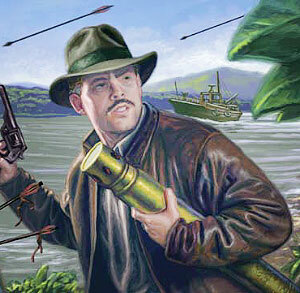 The game ends in one of two ways: The investigators either overcome the Mythos threat, or they are defeated by it. An investigator must close the last gate on the board, such that there are currently no open gates. When the last gate is closed, the players must have a number of gate trophies equal to or greater than the number of players. These gate trophies do include the one just awarded for closing the last gate, but do not include any trophies the players have spent. If these two conditions are met, the players immediately win. Stability is restored to Arkham as the Ancient One slips back into a deep slumber for a few more millennia. If, at any time, there are six or more elder sign tokens on the board, the players immediately win. The Ancient One is driven away and peace returns to Arkham. If the Ancient One awakens but the investigators manage to defeat it, the players immediately win. The Ancient One is banished beyond time and space. If the players achieve one of the preceding victory conditions, the investigators have defeated the Mythos threat and saved Arkham. The player with the most gate trophies is awarded the honorary title of First Citizen of Arkham. In the case of a tie, the title goes to the player with the most monster trophies. +1 for every three unspent monster trophies held at the end of the game. +1 per sane, surviving investigator at the end of the game. If the Ancient One awakens and defeats all of the investigators in battle, the space-time continuum ruptures, the Ancient One is unleashed, and all of mankind suffers for the investigators' failure. In this unfortunate event, all players lose the game.